Getting exercise by participating in sports is highly encouraged, but sometimes injuries can happen that may slow you down or keep you out of the game completely. At PhysioNow, whatever your injury, we can help rehabilitate you so you can get back on the court! There are many types of sports injuries that can occur to the body due to accidents, improper or ill-fitting gear, insufficient warm ups, bad training practices, or being out of shape. These injuries can include sprains and strains, swollen muscles, rotator cuff injuries, shin pain, knee problems, fractures, and dislocations. 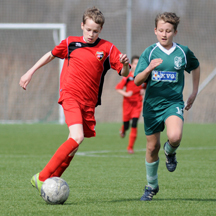 When you are injured during a sports activity, it’s important to stop playing as to not increase your injury. Properly stretching and strengthening the injured area while giving it time to heal is the best way to prevent worsening your current injury, and will also help you avoid future injuries. Relieving pain and reducing swelling are the first steps on the road to recovery, but sometimes our bodies need a bit more than that to return to their pre-injury strength and flexibility. That’s where the trained experts at PhysioNow come in! Through physiotherapy, massage, and sports therapy, we can help you recover from any sports injury. One of the most common types of injuries, neck problems can be highly debilitating and affect almost every aspect of your day-to-day life. They can be caused by a number of things including disc herniation, ligament injuries, and degenerative changes in the joints but regardless of the cause, they often take some time to heal. Whether you are experiencing stiffness, numbness, or sharp pains, the best solution is guided exercise and stretches designed to carefully loosen and relax these tense muscles. Many people experience back pain, especially in the lower back, when they make sudden changes to their level of activity and exercise. Core muscles have to work extremely hard during many sports activities and are easily injured after long periods of inactivity. 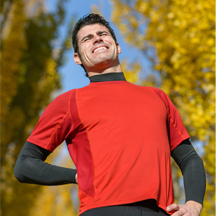 Severe back pain can make it hard to sit or bend and can have a serious impact on your quality of life. Stand up straight again with the expert treatment of our talented staff. Many sports also require the shoulders to work pretty hard, increasing the risk of rotator cuff injuries, dislocations, and AC joint sprains or strains. A common area for sports injuries, shoulders often take some time to heal on their own and can be surprisingly debilitating. Regain your full range of movement and reduce your pain by visiting our office to see what our expert physiotherapists can do for you! 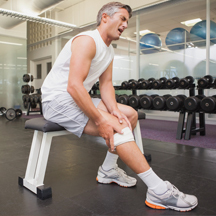 Sport-related knee injuries are extremely common. This is mostly due to the fact that the human knee is not a very well-designed joint. There are many ways in which it can be injured, and injuries can take a long time to heal on their own. Our therapists are trained to assess and evaluate every part of the knee joint in order to establish a treatment plan to reduce your symptoms can get you back in the game. Custom knee braces, or off the shelf bracing is readily available at the clinic. Come and see us today! Tennis elbow and golfer’s elbow are both common injuries caused by overuse of the muscles and tendons surrounding the elbow. Tennis and golf are both harsh sports for the elbow muscles, relying on repetitive motions which can cause stress injuries to the area. Another badly designed joint, the ankle is probably the part of the body that we see the most injuries to. And once it is injured once, it is extremely easy to continue injuring it. Strengthening the ankle muscles is essential in preventing future injuries which can eventually lead to a stress fracture. It is also very important to retrain the proprioceptive fibers of the ankle to prevent rolling it again and perhaps breaking it the next time. Whatever level of sports injury you have incurred, there are options available for your healing and treatment. Contact PhysioNow and get back to your body and back on the field! Should I have an x-ray done before I begin treatment? Xrays are not necessary before you start physiotherapy treatment unless there is a concern that you may have a broken bone. In that case, please proceed to get an xray first. Otherwise, we do not require any tests to be done before you start physiotherapy treatment. If it looks like there is something wrong when we assess you, we will send a note with you to go back to your doctor asking for specific further testing to be done. 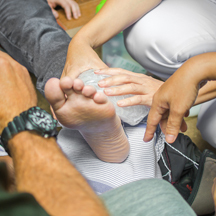 Is sport injury therapy covered by my insurance provider? Yes, Registered Physiotherapy should be covered under your regular Health insurance plan if you have coverage for Physiotherapy. You may need a doctors note for your plan to cover the treatment. Our treatment would be billed as Registered Physiotherapy. How many sessions are needed before I can become active again? Typically, your plan will cover you for either a certain amount of money per year for Reg. Physiotherapy. Some plans cover a certain amount per visit with no limit on the number of visits per year. Each plan is unique. Each plan renews on a certain date each year. This varies between plans although the majority reset in January each year. To be sure, it would be best to call the plan administrator to check on this. We can also call for you at the clinic as long as you are present when we make the call. Due to privacy concerns, the insurance providers will not discuss your plan with us unless you give them permission. Some of the strategies that help with prevention of sports injuries include: 1. warming up before going to intense activity; 2. build up your training gradually so that your body is ready to work hard at more intense levels of sport ; 3. Be careful to move your feet as you are pivoting so that you don’t stress the ligaments of your knees; 4. wear proper shoes and protective gear for your sport of choice; 5.hydrate well during sports events; 6.Listen to your body: there is a difference between pushing through muscle fatigue, and burning pain that indicates injury: Learn to recognize the difference! ; 7. Get injuries assessed and treated quickly so that they do not become chronic; 8. Identify a Physiotherapist that you trust that can help you when something doesn’t feel quite right. Will I be provided excersies at home to help speed up recovery?